Grambling’s SWAC win streak stops at 26 games as Jalen Morton and Prairie View get breakthrough win. DALLAS – For the second time in a week, a major HBCU streak was ended on Saturday night. Prairie View A&M, led by a big day from quarterback Jalen Morton, beat Grambling 22-16 in the 93rd State Fair Classic. 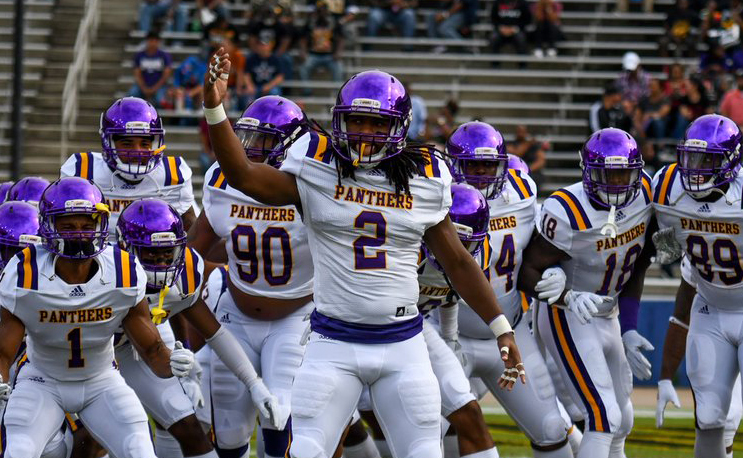 The Panthers (3-3 overall, 2-0 SWAC) defeated the Tigers (1-3, 1-1) for the first time since 2013 as well as ending the Tigers’ 26-game Southwestern Athletic Conference winning streak, which began in 2015. Jalen Morton completed 23-of-34 passes for 269 yards with three touchdowns and one interception and also rushed 13 times for 62 yards. Dawonya Tucker, the leading rusher in all of Division I football, rushed 19 times for 72 yards and also caught three passes for 89 yards and a touchdown. The Panthers’ defense kept Grambling out of the end zone until the fourth quarter, registering 10 sacks, including three by DE Willie Green. After the Tigers scored on back-to-back drives in the fourth quarter, and recovered an on-side kick, Prairie View A&M CB Ju’Anthony Parker’s interception with 1:42 remaining sealed the win. Prairie View A&M scored touchdowns on back-to-back possessions in the first quarter less than three minutes apart. Morton completed the first scoring drive with a short pass to Markcus Hardy, who outleaped a Grambling defender, then shook off another tackle on a 38-yard scoring pass on the far sideline to give the Panthers a 6-0 lead with 4:20 to play in the opening quarter. On the second play of the next Panthers’ drive, Morton flipped a screen pass to Tucker, who got a big block from OL Christian Rice and then maneuvered through the Grambling defense on an 80-yard scoring play for a 12-0 lead with 1:33 to play in the first quarter. A Zach Elder field goal extended the PVAMU lead to 15-0 with 6:31 to play in the second quarter, as a late Grambling safety gave the Panthers a 15-2 halftime lead. In the third quarter, a nine-play, 61-yard drive ended with a four-yard scoring pass from Morton to Zarrian Holcombe to give Prairie View A&M its largest lead of the night at 22-2 with just over four minutes to play in the third quarter, setting up the dramatic fourth-quarter finish. Prairie View A&M has a bye next week and will play its home opener Saturday, Oct. 13 vs. Southern at 5 p.m. at Panther Stadium.